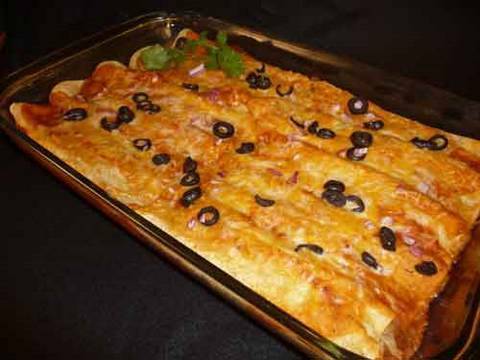 Chicken and Bean Enchiladas Recipe : Enchiladas are a comforting Mexican dish, made with tortillas rolled around various fillings, covered with chili sauce and cheese and baked until the cheese is melted. They are usually garnished with fresh green onion, cilantro, and sour cream. 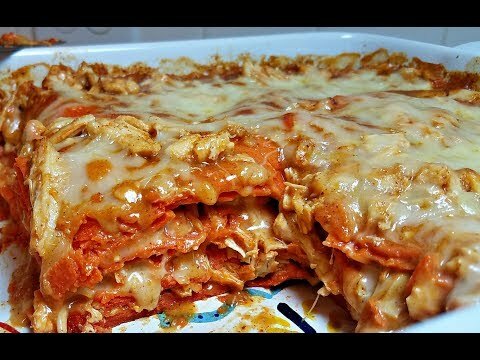 Ingredients: Makes 6 servings 6 flour tortillas (8 inch-20cm) Enchilada sauce 2 tbsp (30 ml) vegetable oil 1 small onion, chopped 2 garlic cloves, minced 1 tbsp (10g) flour 2 tsp (6g) chili powder 1/2 cup (120g) tomato paste 2 cups (500ml) chicken stock 1/2 tsp (1g) ground cumin 1/2 tsp (1g) ground coriander 1/2 tsp (1g) oregano 1 tsp (5g) salt Chicken Bean Filling 2 cups (300g) chicken breast, cooked and shredded (from about 1 pound uncooked chicken breast) 1 red chili pepper, chopped 1 cup (100g) cheddar cheese, grated 3/4 cup (180g) enchilada sauce 1/2 cup (90g) red kidney beans, cooked fresh cilantro, chopped Topping Remaining enchilada sauce 1 cup (100g) cheddar cheese, grated Optional Garnish Fresh cilantro or parsley sour cream spring onion, chopped If you want to do everything from scratch, you can prepare the chicken stock and tortillas one day in advance. For homemade tortillas. Refrigerate and use the next day for assembling the enchiladas. 1. 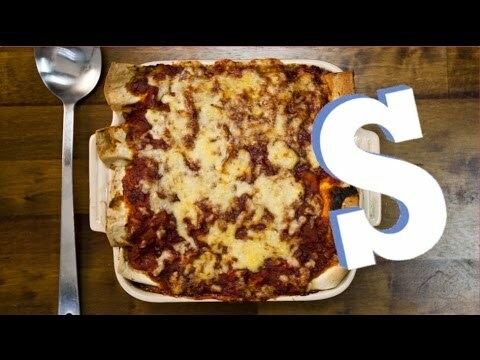 Prepare enchilada sauce. In a saucepan heat oil over medium heat. Add onion and garlic and cook for about 5 minutes until soft. 2. Add flour and cook for 1 minute. 3. Add chili powder, tomato paste, chicken stock, and spices: oregano, coriander, cumin, and salt. Stir to combine. 4. Bring to a boil then reduce to a simmer for 15 minutes. Set aside and use when needed. 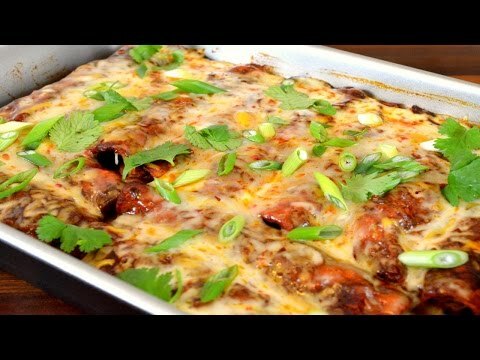 How to prepare the Enchilada casserole: 5. Preheat oven to 350 F (180C). 6. Grease with oil or butter an 8X12 (20x30cm) baking dish. Place a small amount of sauce on the bottom of the baking dish. 7. Prepare the ingredients for the filling, the cheese, red chili pepper, beans, and shred the cooked chicken breast. 8. Place shredded chicken in a large bowl, add red chili pepper, beans, cheese and enchilada sauce. Stir to combine. 9. Place some chicken-bean mixture in center of tortilla, roll up and place into the prepared baking dish, seam-side down. 10. Repeat with remaining tortillas. 11. Pour remaining enchilada sauce over enchiladas. Sprinkle with remaining cheese. 12. Bake for 30 minutes until the cheese is melted. 13. Serve with chopped cilantro/parsley, chopped green onion, and sour cream. 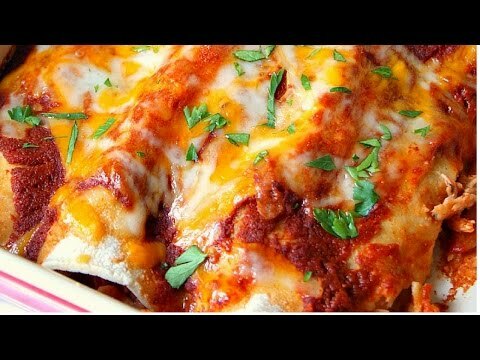 Enchiladas are a comforting Mexican dish, made with tortillas rolled around various fillings, covered with chili sauce and cheese and baked until the cheese is melted. They are usually garnished with fresh green onion, cilantro, and sour cream. If you want to do everything from scratch, you can prepare the chicken stock and tortillas one day in advance. For homemade tortillas. 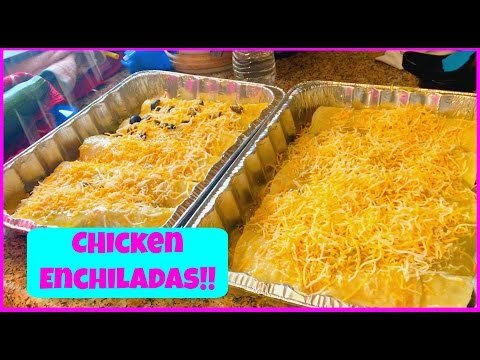 Refrigerate and use the next day for assembling the enchiladas. 1. 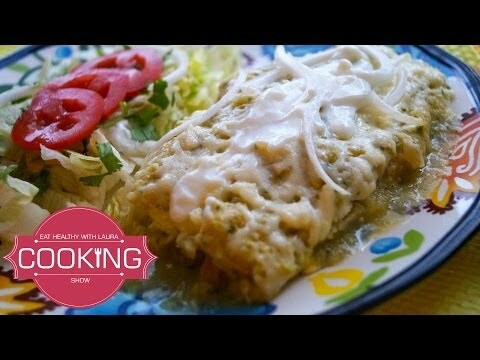 Prepare enchilada sauce. In a saucepan heat oil over medium heat. Add onion and garlic and cook for about 5 minutes until soft. 2. Add flour and cook for 1 minute. 3. Add chili powder, tomato paste, chicken stock, and spices: oregano, coriander, cumin, and salt. Stir to combine. 4. Bring to a boil then reduce to a simmer for 15 minutes. Set aside and use when needed. 5. Preheat oven to 350 F (180C). 6. Grease with oil or butter an 8X12 (20x30cm) baking dish. Place a small amount of sauce on the bottom of the baking dish. 7. Prepare the ingredients for the filling, the cheese, red chili pepper, beans, and shred the cooked chicken breast. 8. Place shredded chicken in a large bowl, add red chili pepper, beans, cheese and enchilada sauce. Stir to combine. 9. Place some chicken-bean mixture in center of tortilla, roll up and place into the prepared baking dish, seam-side down. 10. Repeat with remaining tortillas. 11. Pour remaining enchilada sauce over enchiladas. Sprinkle with remaining cheese. 12. Bake for 30 minutes until the cheese is melted. 13. Serve with chopped cilantro/parsley, chopped green onion, and sour cream.